Officially established in 1905, Artesia took its current name for the Artesian underground wells that helped bring the area to life by providing much-needed water for agricultural purposes. The Artesian wells gradually depleted and gave way to the oil well in 1924. Oil and gas continue to drive our economy along with farming, ranching, dairies, small business, and the Federal Law Enforcement Training Center. In Artesia, there’s never a shortage of things to do. Local residents participate in a myriad of sports opportunities at one of eight local parks, and golfers enjoy the greens at Artesia Country Club. Enjoy our History in Bronze as we pay a larger-than-life tribute to our founders and heroes, all sculpted by local artisans. You’ll get to know who we are as you become acquainted with our stories, from our First Lady of Artesia to the crews on the drilling rigs to the cattle drive monuments to our Wall of Honor at Baish Veterans Park. And of course, don’t miss out on the unique shops and the opportunity to explore the Artesia MainStreet. 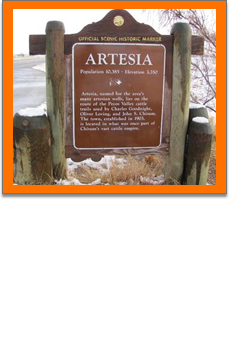 We think Artesia is a great place to live, work, and raise a family. We are a close community that celebrates together. It’s all fun at our School’s Out Summer Splash held the last day of school, or the Back to School Bash on the first day of school. We just might be the only town that throws a party to celebrate the first day of school! Of course, we’re not just about school. Join in on the fun at our annual car show or art auction or come on out and enjoy the highly anticipated Light Up Artesia gala to kick off the holiday season. And, whether you’re a movie buff or not, the annual Let’s Light up the Landsun is sure to be a hit.